Carbs off, cleaned (see separate thread) Not quite back in yet, almost. I gave up and went in for my Sunday roast and never got back out..
Fresh oil waiting to go in. See photo of what and how much came out. 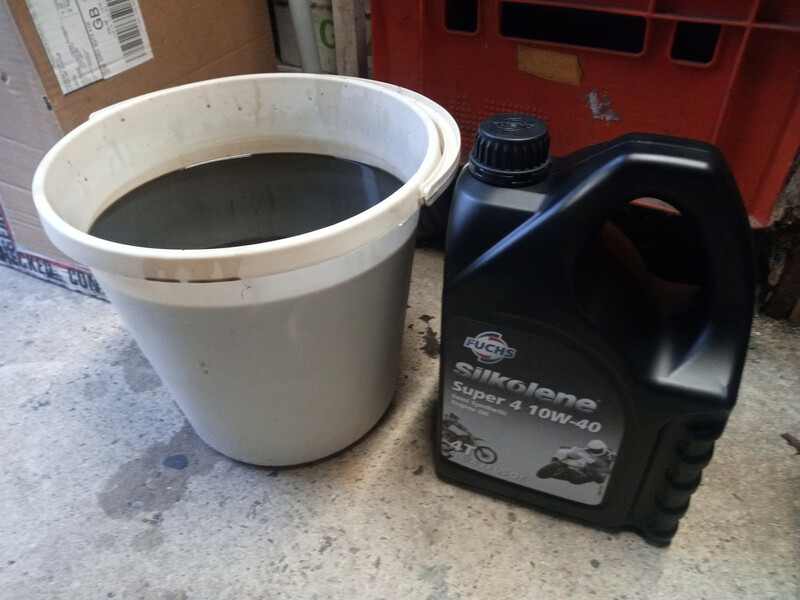 It appears the tank drained it's self in to the sump.. Container of new oil is to scale the size of the bucket which has a 10ltr capacity. There's also a small tub under the bike with a couple of ltrs in it..
Last edited by af1_windy; 5th November 2018 at 08:19 AM. how you going to dispose of the oil/waste. nice bucket for some Molotov's any brexit rallies going on there? Tap seems fine then, as it only started flooding once engine started (which vacuum opens the fuel tap). Issue seems to be a stuck carb float valve. This may not need a carb strip down. Put bike on a paddock stand and try opening the carb float bowl drain valves one at a time, then turning fuel tap to prime whilst tapping on the side of the carbs with a small rubber mallet. If you're lucky this will flush out any grit that may be stuck in a float valve seat. Worked for me many years ago and the issue never came back. Perhaps you already did that but I would examine old oil filter and strain old oil for metallic fragments. If lucky Next thing would be an oil flush. I would dump new oil after first engine warm up. Repeat depending upon second oil condition.